Celebrating the work of EAST LONDON PRINTMAKERS. ELP is a not-for-profit organisation, formed almost twenty years ago, and represents the broad spectrum of interests and talents of its artist members and associates. It also offers opportunities for public access to excellent printing facilities and tuition at its spacious, well-equipped studios alongside the Regents Canal and Mile End Park. 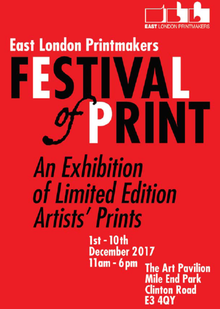 These talents are showcased in the exhibition of affordable limited edition prints by over ninety artists at the Art Pavilion, Mile End Park, the Open Studio event at ELP studios in Copperfield Road E3, and workshops, demonstrations over two weekends at both venues. The recently completed 2017 Box Set will be launched and for sale at the exhibition. Saturday December 9th 12- 4pm at 42 Copperfield Road E3 4RR. Workshops, including drop-in screen print workshop by Jairo and Nicola, demonstrations, artists stalls, sale of prints.